​For nearly three decades, our Opus team members and ConAgra Foods have enjoyed a prosperous partnership. It started in 1990 when our team began constructing ConAgra Foods’ corporate campus in Omaha, Neb. Since that time, ConAgra Foods has enlisted us to design and build a nationwide network of 11 temperature-controlled and dry distribution facilities in eight states, totaling more than five million square feet. The most recent project was the largest building ever constructed for ConAgra Foods – a 1.6 million-square-foot distribution center in Frankfort, Ind. The Frankfort distribution center consolidated three former Midwest ConAgra Foods distribution centers into one centrally-located facility on 300 acres. With 125 dock doors and more than 850 trailer parking spaces, it’s a massive logistics center for ConAgra Foods. Given the economic environment and the driver shortage, ConAgra Foods prioritized attracting logistics carriers and being a shipper of choice. The Frankfort facility was designed specifically to meet that objective. 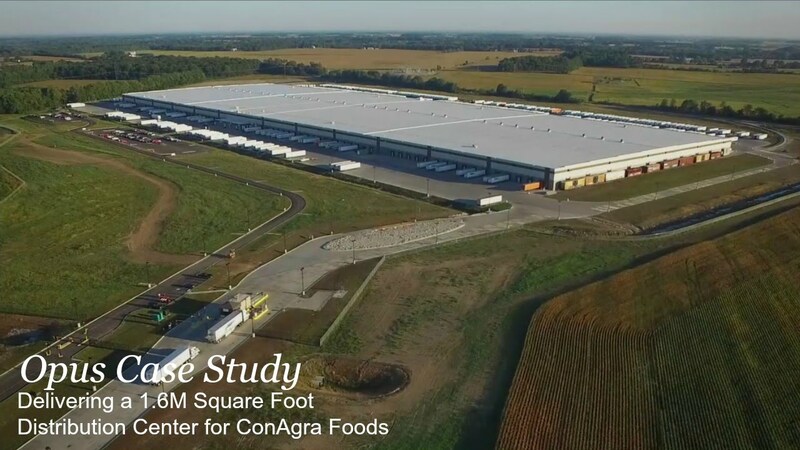 In addition, a key transportation infrastructure improvement project contributed to making ConAgra Foods’ Frankfort distribution center a destination of choice for carriers. Before the Frankfort distribution center opened, we worked with ConAgra Foods, the City of Frankfort and Clinton County to speed up a road construction project that greatly improved access to the distribution center. Clinton County had planned to construct a new road on a section line that ran perpendicular to our site. To improve accessibility for trucks and other vehicles, we convinced the County to redesign the road into an ‘S’ curve, creating a straight-shot, direct access to the facility’s entrance drive. For ConAgra Foods’ carriers, the new road saves time and reduces complexity for trucks accessing the facility. For the county, it has increased traffic safety by providing a truck route that reduces truck traffic on other area county roads. The infrastructure improvement was a winning proposition for all involved parties, as well as the community. The new road now provides a quick shot from State Highway 28, which intersects with Interstate 65, into the ConAgra facility. Delivering this facility for ConAgra involved thoughtful and skillful collaboration by the entire project team, resulting in an incredibly successful outcome that will satisfy ConAgra’s requirements for maximum efficiency and competitive differentiation and empower their mission of making the food people love. Watch the video above to see leaders from ConAgra Foods and Opus talk about their experience in Frankfort and the longstanding partnership between the two companies.